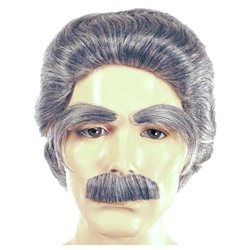 The Deluxe Albert Einstein Wig, Eyebrow, and Moustache Set includes wig, eyebrows, and moustache. Available in gray. Made of high quality synthetic fibers. The wig features an elastic band on the inside for comfortable one size fits most sizing. The Deluxe Albert Einstein Wig, Eyebrow, and Moustache is good for a variety of characters, including professors, mad scientists, or elderly characters.